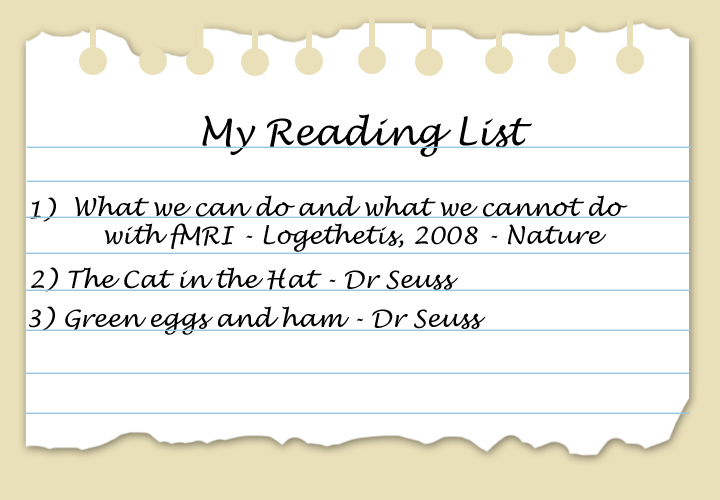 My reading list could actually look like this, I guess I could argue that everything on there is written by a Dr...although fun fact, Dr. Seuss wasn't actually a Dr, it was just his pen-name...I know right...whats even true anymore?! Like our friend in the story, we postgraduate students are also on a journey through a vast open world where new, exciting, and sometimes daunting things happen. At the start, we may find ourselves in a new city or culture far from home and surrounded by new people. Once we get into the nitty-gritty of our studies we may find ourselves attending conferences and needing to network with people we’ve never met before or be required to present our work before academics that have worked in our research area since before we were even born! While I wouldn’t be so cavalier to presume that just going “right along” is enough to overcome any challenge you may face, having a robust ‘give-it-a-go’ attitude will place you in good stead. Being a PGR is a great opportunity, and one not everyone gets to experience. Make sure you make the most of this time and don’t waste any of it stewing on the side lines apprehensive of what may happen. Seize the many opportunities before you and get involved. Sometimes you’ll succeed and sometimes you’ll fail but in both outcomes you’ll learn something new! The story continues and things become very positive for our protagonist who is now excelling at everything he does. Sadly, this doesn’t last long and soon things go disastrously wrong and the journey is brought to a very abrupt stop. This mishap causes our little explorer to experience a ‘slump’. The ‘PhD slump’ is something many students go through, with the most famous being the ‘Second year slump’. This ‘slump’ is often characterised by a period where your focus, enjoyment, motivation and self-belief to achieve the end goal seem to wane. Of course, ‘slumps’ in general can happen at anytime throughout a PhD for various reasons. It can be quite disheartening, demoralizing and difficult to find the motivation to return to your former work flair and rhythm. If you find yourself going through a ‘slump’ period, it’s firstly important to remember that most, if not all, students go through this. Therefore, you may find it helpful to talk to other ‘older’ PhD students who have come out the other side and discuss what helped them make it through. One of the quickest ways to get discouraged or lose motivation is to think about the big picture too much. It’s no surprise that achieving a PhD requires a lot of work and our day-to-day or even weekly actions may seem like they are insignificant and barely scratch the surface of all we need to do. Having an overall plan of your PhD journey that breaks down the larger picture in to smaller, more manageable pieces will help you see how everything fits together, even when progress seems to be slow. Sadly for our little adventurer, this isn’t the only mishap they encounter and while things do get better, other complications soon arise and the journey becomes a series of highs and lows. A PhD can be a very intense experience and there will likely be many highs and lows along the way. Taking onboard Dr. Seuss’ advice to “step with great care and tact” will help maximize the high points and minimize the lows. On the blog we’ve shared many ways you can do this by managing your time effectively, making journals to prioritise your tasks and getting sufficient sleep. Also, let’s not ignore Dr. Seuss’s comment that “Life’s a great balancing act” and remember that your balance shouldn’t be firmly weighed down with work. There is life outside the lab and it's important to take breaks and get away when you can to help you unwind and relax so you can stay motivated and avoid burning out. May 4 Fancy a laugh?